It's Summer Solstice and we have clouds and chilly weather! OK down to the business in hand. Here is my DT card for Tilda's Town where the theme today is Summertime. I have used "Flirt Tilda" from the Magnolia Sakura collection. She's in her garden pruning the roses. I used some bright papers that I have had for ages, so long ago that I haven't got a clue what they are but they have clouds, alphabets and bright Summer colours. All the flowers and the little watering can are from my stash and the fence and ivy are Doohickey dies. 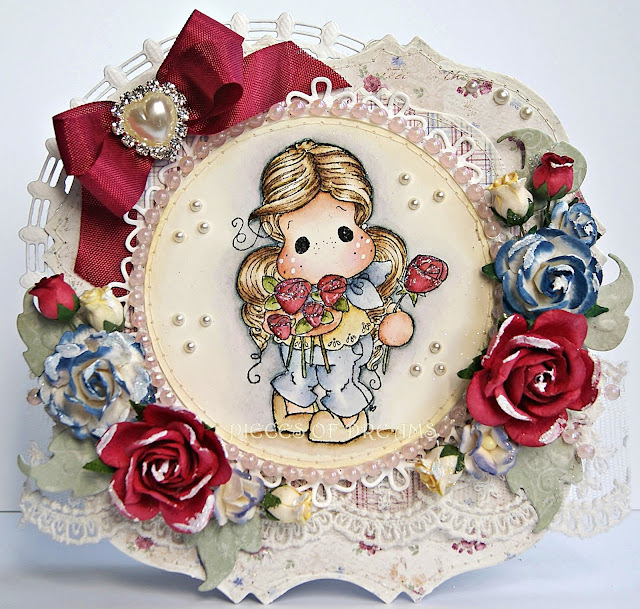 Tilda was coloured with distress inks. Peeping from the back is a Joycraft Die. 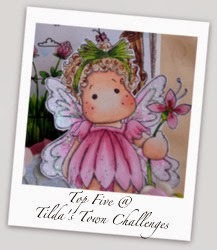 I hope you will join in with us over at Tilda's Town this week. 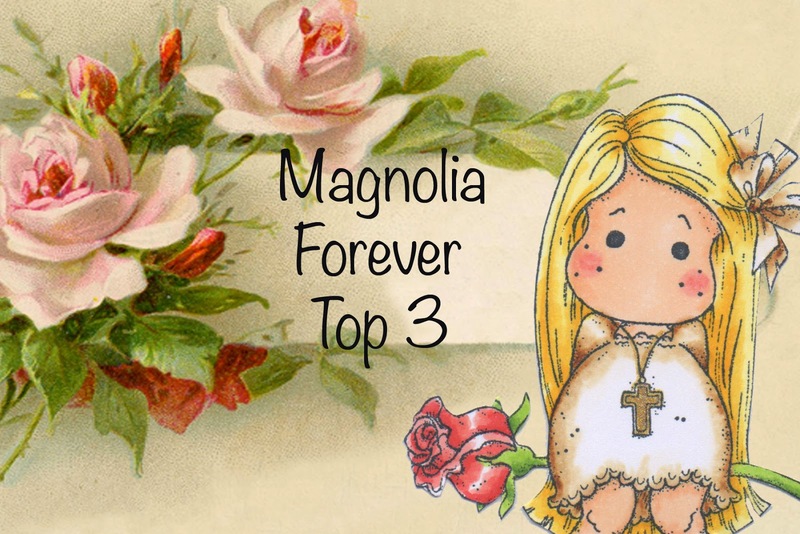 I am here to remind you that we are now half way through the latest challenge at "All About Magnolia" and the Design Team have made some more cards to inspire you. 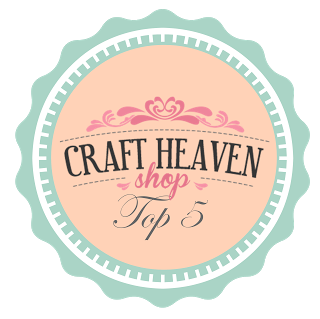 As usual we have two sponsors - our lovely Magnolia Sweden and Live and Love Crafts, both of whom I could not craft without...seriously! I have used "Tilda with Ribbon Shoes." She has been painted with Distress inks, then stitched to a Joy Craft die. Her lace and hair have had a little Glamour Dust added. I have made one of my easel cards using Maja Spring papers, all cut with Go Kreate dies and stitched with button thread. It was a real struggle for me last week. Somehow I managed to scratch across the retina of my eye. It was indescribably painful and meant crafting was out for a while. Luckily I had made this and two other cards before it happened or I would have nothing to show you all! So, here we are in June with its long, lazy days and warm sunshine to ripen those strawberries for Wimbledon. These days will pass so quickly. I am determined to enjoy every single minute of Summer this year. The roses in my garden are just out in bloom and are filling the air with their heady perfume. There is nothing to compare to an English country garden in Summertime. My DT card for Tildas Town uses "I Give You a Rose Tilda", perfect for this time of year. This week's theme, Dies or Punches suits me as I love to use both, so this was an easy challenge for me. I used four dies to make this card. Go Kreate for the shape, Marianne for the leaves and image and Joy Craft for the fancy circle at the back. The papers are Maja and they have been stitched, with gesso and ink on the edges. The flowers have gesso and glamour dust. The lace, ribbon and pearl string are from my stash. Tilda was painted with distress inks. 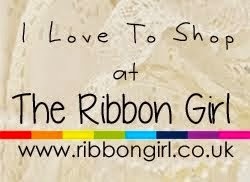 I am just going to catch the train to Stratford for some retail therapy and girly catch-up. I thought would quickly add a new card to my blog while waiting for my friends to call. 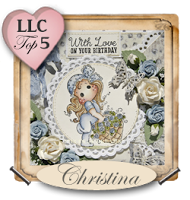 For this card, I used, "I give you a rose Tilda" from the new Magnolia Sakura collection. Glamour Dust to the flowers. I am not good at taking photo's of easel cards. so I have added a separate one of the base. The tag opens for the message and there is a clip charm attached which can be removed and kept as a keepsake. Here is a picture of the main card. 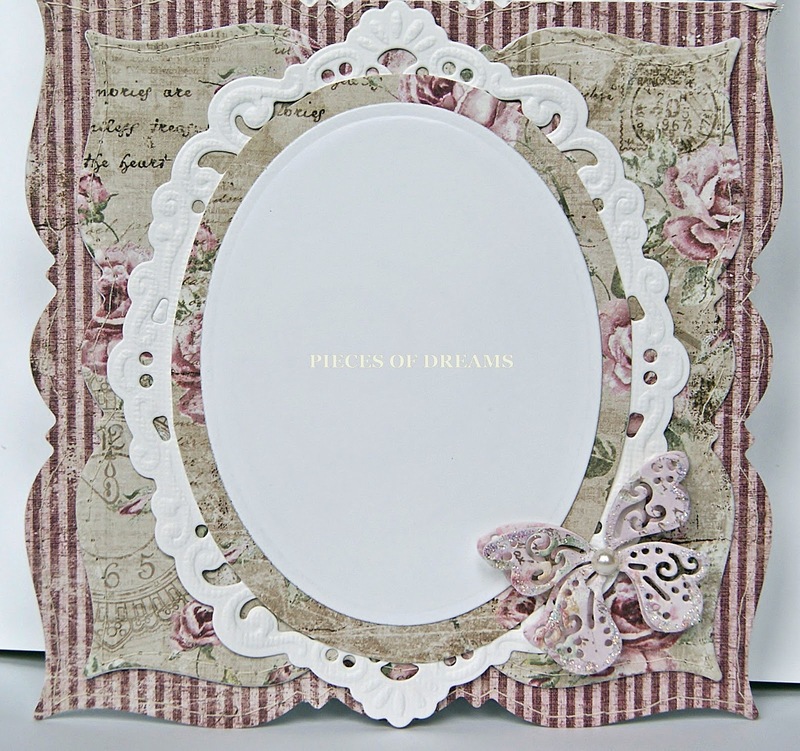 The butterflies have been cut from a Joy Craft border die and doubled, with added glamour dust and pearl beading. The wooden heart has been painted with gesso and glittered. Enjoy your weekend everyone. I hope the sun shines for you. I thought I would post a new card today. This one is a favourite of mine. I love the flowers around her. She is coloured with distress inks onto watercolour paper. 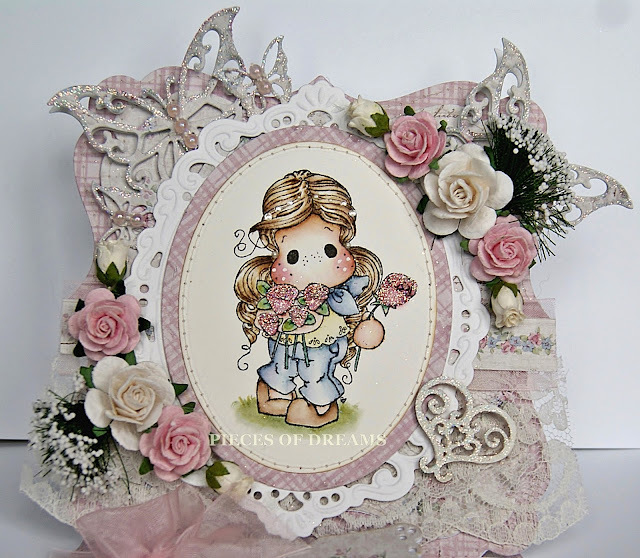 The Maja papers are cut using Go Kreate dies and have been stitched with topstitch thread. 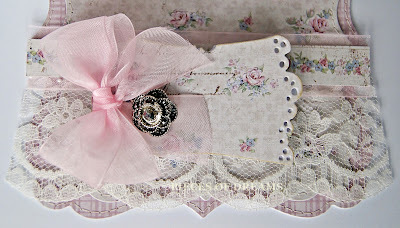 The pretty doilies were sent by a friend in America as a birthday present. The heart at the top is made of wood and has been coated in gesso with a sprinkle of glamour dust. I have used the same around the spellbinders die cut, then placed the image on a different die cut and added bead stringing. I am pleased with how it worked. The cabochon on the bow is from my stash, flowers and papers are from Live and Love Crafts. The inside matches the card front with the addition of a Doo Hickey butterfly. This card is available to buy on eBay.